Most people agree that 1% milk and skim milk don't taste as good as 2%. Some people prefer (or don't prefer) the taste of whole milk. But have you ever noticed that the milk from some grocery stores tastes better than the milk from other grocery stores? Winco and Costco milk taste the best to me. But we hardly ever go there. Savemart milk tastes okay, which is good because that is the closest store. And Safeway milk is my least favorite, which is a bummer because that is where I like to pick up my prescriptions and if we're in dire need of milk (which is at least once a week) when we pick up my prescriptions then I have to put up with being slightly put off the taste of milk for a few days (and then I don't drink it as fast and it lasts longer). Lost Boy thinks it is all in my head. But I know it isn't. Because I've figured out that each store uses different dairies to supply their milk (and other dairy products like yogurt, cottage cheese, and ice cream). 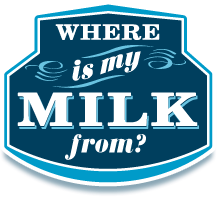 There is a super-neat website called Where Is My Milk From? that shows you where your cows live. It is really easy. You find the dairy code printed on your milk bottle, enter it at the website (the search box is prominent on every page hosted by the site), and viola! find out what dairy makes your milk and where it is located. I found this site a few years ago and thought it was neat. But when I realized that milk tastes different depending on where it is from, I decided to find out which dairy I like. So far the verdict is that I like milk from Berkeley Farms in Hayward (they make milk for both the Berkeley Farms and Hy-Top labels). And I don't much like the milk from Super Store Industry in Fairfield (Bayview and Sunnyside labels). I wish I could drive out to Winco everytime I need more milk. I wonder if Savemart would change dairies? Probably not. I think the dairy I like is over 40 miles away.